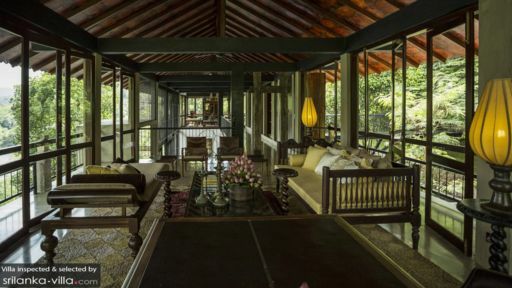 Seeped in history and built in the quintessential Kandyan fashion, The Hermitage, is a three-bedroom serene retreat on the edge of the famous Victoria Reservoir near Kandy, Sri Lanka. As the name suggests, the hotel is a luxury getaway for those who wish to rediscover themselves amid surroundings that are as natural as they get. Views across mountains shrouded in delicate mist, waking up to the sound of chirping birds and animals, and indulging in a lakeside massage with naturally-made oils is the epitome of a perfect tropical getaway. Ideal for couples and a group of friends, this restful and laid-back abode is utmost luxury and comfort pre-designed to offer guests a wonderful time. The villa has been designed in such a way that no matter where you are, you always have a front-row seat to views of the reservoir and the mountains. Such is the case from the three, luxurious bedrooms – Kundalini, Samatha, Vipassana – as well. Each has been designed with a similar antique aesthetic with supersized king beds, vintage armoires, and luxe lighting. Each bedroom is designed with modern comforts such as air-conditioning to make sure you are not inconvenienced in any way. You will find murals, tapestries, and a ubiquitous sense of calm and spirituality. There are ensuite bathrooms with opulent interiors, stone bathtubs and showers, and mesmerising views. The Hermitage is found in the centre of six acres of forest land that give you an idea of what’s in store. There are more than 40 species of birds and a variety of animals that share the same land as you. This resplendent and luscious area is the right ingredient to help you unwind and rejuvenate. 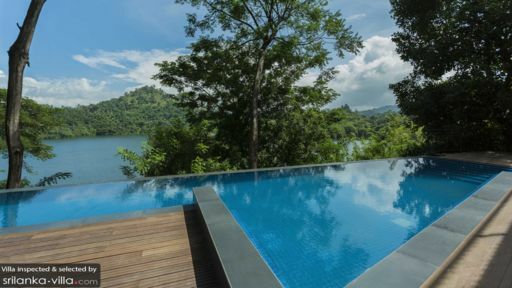 The infinity swimming pool looks out across thickets of dense trees and is bordered by a wooden pool deck lined with sunbeds. There is a terrace with outdoor dining and sitting as well overlooking the water frontage of Victoria Reservoir. The villa has been so built by a renowned Sri Lankan architect and designer who have gone out of their way to provide guests with a home that echoes antiquity and tradition. Completely designed with antique furniture and fixture, the living area at The Hermitage features leather sofas, selective photographs, a natural rock floor, and rustic furniture. Each element has a story to tell and there is not just one space where you can find rest. 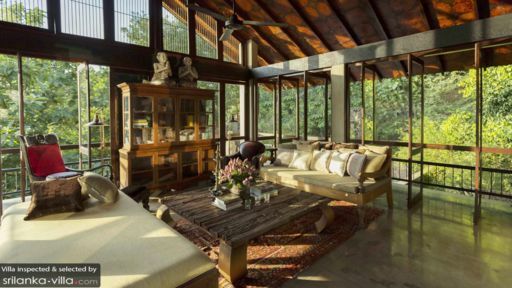 A second and third living area is found at the villa which are both open concept surrounded by and open to the most luscious tropical flora and abundant sunlight. Each of these feature unique takes on Kandyan design with an old-world charm so intrinsic to Sri Lanka. The house is multi-storied thus, the dining area is found downstairs with stunning views across the garden or the water on the other side. An eight-ten seater dining table stands majestically in the centre which is where many memories are made over great food and conversation. As luxurious as your living arrangement, so are the services provided by the highly-trained and professional staff at The Hermitage. The team is ready to serve guests with gusto and they are welcoming as they are kind. There is a spa where you can get massages using oils made in the villa itself. Rent out cars or a scooter to travel around and book a private chef to enjoy local flavours delivery straight by the expert. Indulge in yoga and meditation anywhere in the villa. The villa is conveniently located mere 11 kilometres from the city of Kandy in Sri Lanka which is home to the famous Temple of the Sacred Tooth Relic. You can even make your way to the Kandy Lake from pleasing views.